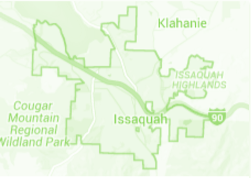 Rich with history and culture, Issaquah was incorporated in April 1892. The town, originally named Gilman, would soon become one of the most desired places to live in the Pacific Northwest. A community serving more than 33,000 residents, Issaquah, commonly referred to as the ‘Trailhead City’ is surrounded by mountains and offers a piece of outdoor adventure for everyone. Located 15 miles east Seattle, this majestic community makes for an easy commute or day trip exploration. Famously known for it’s hiking, biking, paragliding, festivals and opportunities for outdoor activities, Issaquah is a mecca for the nature enthusiast. The town is diverse and cultured, offering a piece of paradise whether you are a resident, a visitor or just passing through. Downtown Issaquah is quickly becoming a hotspot for socializing and connecting with a funky vibe. Full of restaurants and pubs, art galleries featuring local artists, nightlife with the spotlight on upcoming musicians, and theatres. Issaquah was voted one of the most livable cities in the country by Outsider Magazine. There is a surplus of free public parking throughout the downtown area although you won’t need a car at all once you find a place to park. Issaquah is walker friendly with pedestrian flags provided at crossings to make transit safe and easy. Full of memorable activities and attractions, Issaquah will have you sipping local wines while touring outdoor public artwork, watching live glass blowing demos and catching the salmon at the fish hatchery. When you visit, make sure you sample some local craft beers, grub on hand-crafted BBQ, and indulge in a designer cupcake or frozen yogurt for a touch of sweet. Famous for it’s hiking and breathtaking views, Issaquah is surrounded on three sides by the Issaquah Alps. Squak Mountain, Cougar Mountain and Tiger Mountain, are famous for their hiking trails with astounding views, paragliding and outdoor exploration. The Issaquah Alps Trails Club is dedicated to maintaining and protecting the mountains, valleys, rivers, and streams of the Issaquah Alps area. The club also provides schedules, maps, safety information and organizes public hiking events. Rattlesnake Ridge, Poo Poo Point, High Point Way Trailhead, and Chirico Trailhead are some of Issaquah’s most prized natural possessions. Whether you are planning a day trip to explore Issaquah’s largest shopping center, or making a quick trip to pick up a birthday gift, Gilman Village will never disappoint. This renowned Issaquah historical landmark, and outdoor shopping center, is home to restaurants, shops, personal services, and even a preschool. In the heart of Issaquah, right off of Gilman Boulevard, Gilman Village has over 10 eateries ranging from various ethnic cuisine to cold pressed organic juice. It is easy to let the day slip away from you as you explore the unique shops complete with vibrant clothing, jewelry, home decor, and kitchen goods. After you shop, stop off for a bite to eat at the much desired Flat Iron Grill. After you dine, consider relaxing in a yoga class at Village Green Yoga, or indulging in a new hair style at Hairtune Salon. No matter how you decide to spend your day in the Village, you will always leave feeling relaxed and eager to return for more indulgence. One of Issaquah’s newest hotspots the homes in Issaquah Highlands combines the excitement and modern conveniences of the big city with the comfort and relaxed quality of life found only in the suburbs.